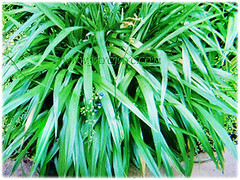 Umbrella Dracaena or Flax Lily is a free-flowering perennial herb that blooms all year round. 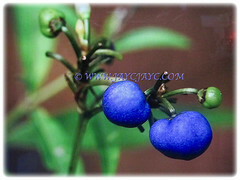 This beautiful plant that produces attractive flowers and shiny deep blue fruits is considered poisonous in China and cattle are said to die from eating them. 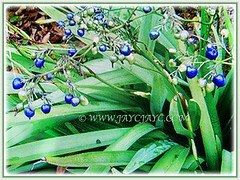 Botanical Name: Dianella ensifolia (syn. : Dianella nemorosa, Dracaena ensifolia, Dianella parvilora). 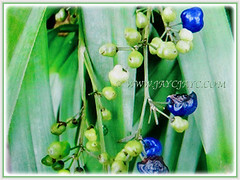 Common Names: Umbrella Dracaena, Flax Lily, Common Dianella, Sword-leaf Dracaena, Cerulean Flax-lily, Siak-Siak in Malay. Family Name: Asphodelaceae (prior to 2017, it was classified in the Xanthorrhoeaceae and Hemerocallidaceae family). Etymology: The genus name, Dianella is named after Diana, a goddess of Greek mythology. The specific epithet ensifolia in Latin means with sword-shaped leaves, referring to the shape of its leaf blades. Origin: Native to Madagascar, India and Sri Lanka to the Himalaya, Tropical Asia, southern China, Taiwan, Japan, Malesia, Singapore, and the Pacific Islands. It is widely cultivated elsewhere around the world. Plant type: A herbaceous and grass-like perennial shrubby plant. 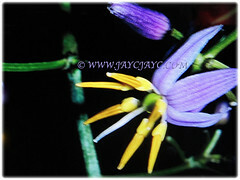 Features: Dianella ensifolia is from the genus Dianella that consists of about 41 species of flowering plants. It is an evergreen and perennial herb that grows from a branched and gradually spreading rhizome. A moderate-growing shrub that can reach up to 1.5 m in height and spreading at the roots to form quite a large clump. Its flowering stem bears two rows of sessile leaves that are grass-like, green and smooth on the keel and edges. The leaves have leathery leaf blades that are sword-shaped, tapered at both ends and 20-60 cm long with sheaths below clasping the stem at the base. It produces a panicle inflorescence, 30-60 cm long, rising above the foliage from the tip of its stem. 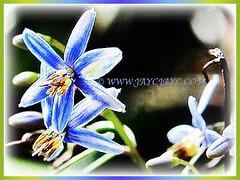 Bisexual and star-shaped reflexed flowers, 0.6 cm in diameter are coloured in white to blue and purple, with prominent yellow-orange 5 mm long anthers. Flowers will eventually develop into globose, shiny and deep blue or bright violet-blue succulent fruits, up to 1.5 cm wide. 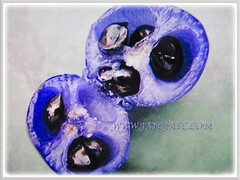 They contain 3-6 ovoid and shiny black seeds, 3-5 mm long. Its flowers are insect-pollinated and its fruits are eaten by birds. 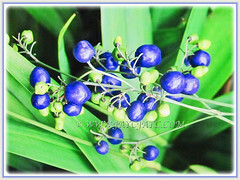 Culture (Care): Dianella ensifolia or Flax Lily can be easily grown with least maintenance. Moisture: Moderate water requirements. Water regularly. Soil: Humus-enriched, moist, loamy and well-drained soils. However, it’s adaptable to any free-draining garden soils. Remove spent flowering stems and withered/yellow leaves to keep it tidy and aesthetically pleasing. Feed once monthly with a balanced organic fertiliser for healthy growth and flower production. 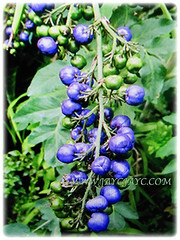 Dianella ensifolia or Flax Lily grows well in tropical and subtropical climates. The plant is frost hardy and tolerates drought and windy conditions. Flowering will be from late spring to mid summer and sometimes even flowering all year round. It is tolerant of a wide range of conditions so should be able to grow from coastal to inland situations. For non-hardy regions, grow then in a pot to easily overwinter indoors. Propagation: Easily propagated by seeds that usually germinate within 1-3 months or division of clumps that spread with rhizomatous roots. 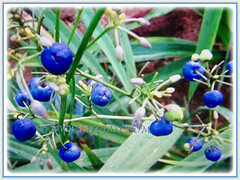 Usage: Dianella ensifolia or Flax Lily with its lush foliage, beautiful flowers and ornamental deep blue fruits will be excellent in parks and gardens. Suitable for mass planting in garden beds and borders. Ideal too as an indoor plant and to beautify the interior of your home. Suited to be grown in large decorative pots, containers and above-ground planters. Besides, its rhizomes, roots and leaves are used as traditional medicine in the treatment for various ailments and diseases. The roots are used for women in the immediate post-partum period and for deworming in Indonesia and Malaysia, as well as in the treatment of leucorrhoea and dysuria. Its sun-dried and sliced roots are used as topical application locally on lesions such as furunculosis, abscesses, lymphangitis, tuberculous lymphadenitis and ringworm. The boiled leaves are used to make incense while the aromatic rhizomes and roots are used in cosmetics and perfume. A mixture of the pounded rhizome and rice is roasted and used as rodent poison. Plant it as it’s a magnet to attract birds that eat its fruits.